Richard A. Ferri, CFA, is the founder and CEO of the investment firm Portfolio Solutions, LLC. An author of four previous books on low-cost investing, Ferri earned a bachelor of science degree in business administration from the University of Rhode Island and a master of science degree in finance from Walsh College. He worked at two major Wall Street firms for ten years before starting Portfolio Solutions in 1999. The company manages over $1 billion in separate accounts using ETFs and index funds. Clients include individuals, nonprofit organizations, and corporate pension plans. Chapter 1 ETFs from Evolution to Revolution. Chapter 2 The Nuts and Bolts of ETFs. Chapter 3 Types of Exchange-Traded Portfolios. Chapter 4 ETF Benefits and Drawbacks. Chapter 5 Actively Managed ETFs. PART II: THE INDEXES ETFS FOLLOW. Chapter 6 Market Indexes and Custom Indexes. Chapter 7 Index Strategy Boxes. Chapter 8 Index Security Selection. Chapter 9 Index Security Weighting. PART III: ETF STYLES AND CHOICES. Chapter 10 Broad U.S. Equity and Style ETFs. Chapter 11 Global Equity ETFs. Chapter 12 Industry Sector ETFs. Chapter 13 Special Equity ETFs. Chapter 14 Fixed Income ETFs. Chapter 15 Commodity and Currency ETFs. PART IV: PORTFOLIO MANAGEMENT USING ETFS. Chapter 16 Portfolio Management Strategies. Chapter 17 Passive ETF Portfolios. Chapter 18 Life Cycle Investing. Chapter 19 Active Portfolio Management with ETFs. Chapter 20 Special Portfolio Strategies. Chapter 21 Operational Tips for ETF Investors. Appendix A: Index Strategy Box Abbreviation Guide. 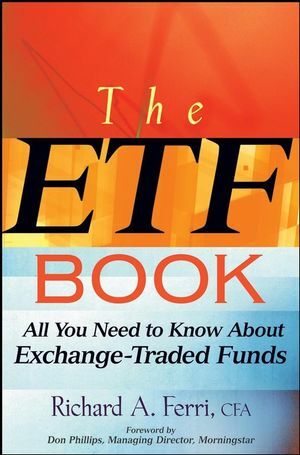 Appendix B: ETF Resource List.